Touchless faucets seem like a technological miracle: Place your hand under the spout and water starts flowing like magic. But their inner workings rely on technologies that have been around for decades, cleverly adapted to a faucet spout. Touchless faucets, also known as automatic faucets, have four key components: sensor, solenoid-controlled valve, power source and spout. 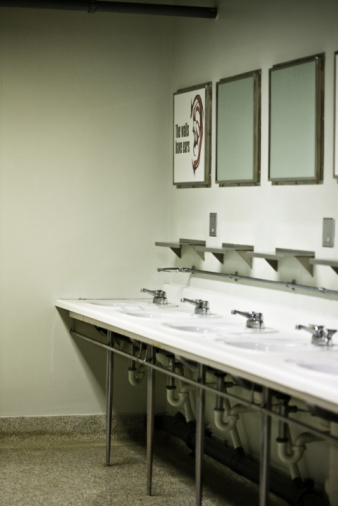 Touchless faucets in public bathrooms reduce the spread of germs. The sensor in a touchless faucet typically is located at the lip or base of the spout. It isn't a motion sensor but a presence sensor designed to detect the presence of hands under the spout and turn on the faucet. When you remove your hands, the sensor tells the faucet to turn off. Most faucet sensors use a tiny infrared light mounted next to an infrared detector. When your hands come within a few inches of the lip of the spout, infrared light bounces off your skin to the detector, which sends a signal that turns on the faucet valve. Some faucet models use an ultrasonic field sensor that turns on the faucet valve when your hands disrupt the field. The faucet sensor typically controls a solenoid-activated diaphragm valve. The solenoid is an electromagnet that can push or pull, depending on electric polarity. Diaphragm valves use a rubber-like disc to control water flow. The valve is normally held closed, but in response to a sensor signal that hands are present, the solenoid pulls the valve open so water can flow out the spout, then pushes the valve closed again when the sensor says the hands are gone. Most touchless faucets dispense only warm water, but some models can provide hot or cold water. All touchless faucets require a power source. Some models draw power from dry-cell batteries, while others use a low-voltage current from an AC transformer. Electricity powers the sensor, control electronics and water valve. Battery-powered faucets use latching solenoid valves that stay in the open position without further electric current until a spurt of power pushes them back to the closed position. Transformer-powered faucets use continuous electric current to hold the solenoid valve open. Touchless faucet spouts, which hold all the working parts, are made of zinc in cheaper models, while the high-end models are made of brass. They may be plated with nickel or chrome for durability and appearance. The spouts may be machined, die cast or sand cast. There are different styles of spouts for standard bathroom or kitchen use, lab sinks, bar sinks and food service sinks. The spout also is where aesthetics come into play. The shape and finish of the faucets' spouts are major reasons buyers choose one touchless faucet over another.